To tackle the growing prevalence of fibroids among women, Benjamin Olowojebutu Foundation (BOF), weekend unveiled its Love story to offer free fibroids surgeries to 1000 women free of charge. The Executive Director of the Foundation, Dr. Benjamin Olowojebutu who announced this in Lagos described fibroids as a benign mass that grows in the womb even as he regretted that fibroids ranks among one of the conditions affecting women across Africa. According to him, a lot of these superstitions, myths and fallacies surrounding the condition are the main reasons women are dying from fibroids. He said, however, the risk of developing fibroid could be reduced if a woman married early and there was a break in their menstrual flow. He said the major challenge contributing to the reason many people seek for other alternatives was due to the cost of surgery which he said ranges from half a million, adding that the foundation was ready to meet the needs of indigent women who could not afford to pay for surgeries. Unveiling the Love story of BOF and journey to a 1000 free surgeries this year, Olowojebutu who is also a surgeon disclosed that BOF carried out no fewer than 626 free surgeries last year. 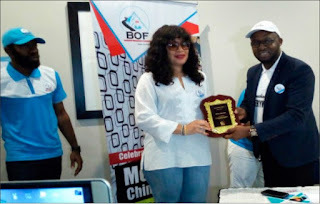 He explained that the BOF was a dream birthed and driven by love and compassion to help indigent people suffering from various diseases such as Fibroids, Lipomas, Breast lumps, Hydrocele and Hernias. Recalling that the in 2018 Vision36 was born, to treat a minimum of 36 indigent women free of charge in each of the six Geo political zones of Nigeria, he said: the goal of BOF is to in the long run change the health care space with love and compassion. He said this year, the foundation’s project tagged: ‘Journey to 1000 free surgeries” will be helping 1000 indigent patients suffering from Fibroids, Lipoma Breast Lumps and Hernia. He said that BOF would be having its first out station outreach in Gambia and South Sudan July, 2019.